We rely on the generosity and open hearts of others as we guide children through their unique life-limiting or end-of-life journey. Thank you in advance, for taking part in providing peace, comfort, and support to those here at Ryan House. Interested in donating in-kind items to support the children and families of Ryan House? Items can be donated directly to Ryan House Monday through Friday, 9:00am to 5:00pm. Appointments are preferred. Download our printable Ryan House Wish List below! If you are interested in hosting a special drive to collect in-kind items for Ryan House please contact us directly at 602.200.0767 or info@ryanhouse.org so we can share with you the most urgent needs. Every little bit helps. Gift Cards, of any denomination, donated to Ryan House are used by the Care Team to purchase much-needed items for the children or are donated to families in need. A brief but touching book about two young girls caught in the horror of the Nazi occupation of Poland in the 1930’s. It underscores the weight of a single, selfless gesture and the impact of just a few words and how the two together empowered one to “hold on. Gerda Weissmann Klein, author of several books and the subject of an Oscar-winning film, One Survivor Remembers, survived the Holocaust and has spent years carrying a message of hope and courage, and the challenge to all she meets to leave a legacy. When she met Ryan Cottor, namesake of Ryan House, his courage and spirit touched her and he reminded Gerda of her dear friend, Ilse. And like Ilse, Gerda feels Ryan, too, is leaving a legacy. It is named Ryan House. 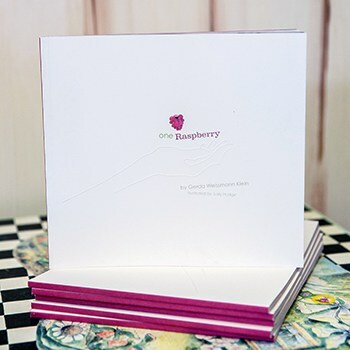 Gerda Weissmann Klein has dedicated her book, One Raspberry to Ilse and Ryan Cottor. Each book is $20.00 and all proceeds from the sale of One Raspberry go directly to the Ryan House Endowment Fund. Interested in purchasing One Raspberry? Buy a copy of your very own through the Changing Hands location in Tempe, AZ.